Esoteric Astrology is the study of astrology from the Soul's point of view, it is a discipline through which we can develop some understanding of what the Soul is attempting to accomplish in this place at this point in time. The word astrology comes from the early Latin word astrologia deriving from the Greek ἀστρολογία, which means 'account of the stars'. 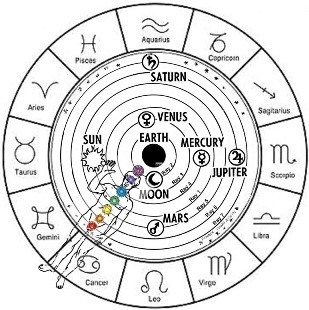 It is the search for meaning of the human affairs and events in the sky, of how the positions and aspects of the planets have an influence on the course of earthly events and human lives. The exploration of astrology from the esoteric point of view adds a profound meaning to this investigation. Esoterisicm teaches that underlying the physical body exists a vital or etheric body which is the matrix and the true form of the outer manifestation. This vital body transmits the energy force of the various subjective aspects to our human nature and it is also the agent of the indwelling life and consciousness. The individual etheric body is not an isolated and separated but is an integral part of the etheric body of the humankind, which is itself a constitutive part of the planetary etheric body, and part of the etheric body of the Sun, the solar system and constellations. Throughout this cosmic golden web there is a constant circulation of energies and forces, which form the foundation of the astrological theories. All these cosmic forces pour through the etheric body of the individual upon the physical plane, and condition the outer physical expression, activities and qualities. Within the human etheric body there are seven major energy centres, the chakras, which provide dynamic force and qualitative energy, producing definite effects, influencing the evolution of each individual. The planetary influences indicate the trend of the outer life circumstances. When correctly interpreted, they give an indicatication of the personality destiny and fate, but they also condition and control the person without any conscious Soul experience. The moment that an individual becomes aware of the Soul and is endeavouring to understand the soul's intent, the influence of the planets become a potential to awaken the possibilities hidden in each experience and activate our true destiny. The esoteric purpose of this ancient science of initiation, is therefore, to stimulate the development of consciousness and intuition, where intuition is considered the faculty of the higher mind to see the essence beyond the form and the energy beyond matter and the ability to discern the beginning, the end, and the probable pathways that the life force may take in the different circumstances. When intuition on the level of the Soul is properly fused to the Personality, a wonderful alchemy takes place. An individual becomes aware of the fact that the soul is the intermediary between essence and its physical manifestation and that our task is to provide the tools through which consciousness may exteriorize and come to know itself. Once the personality is infused with the purpose of the Soul, we can understand our true life work and undertake the different preparations to realise it. The result of this movement of consciousness is the building of a link between the Soul and the personality, manifesting what in Esoteric Astrology is called the Rainbow Bridge.